Squash pudding was a common dish in the 18th and 19thcenturies and receipts are found in a number of early cookery books. Most receipts seem to have used a winter squash. 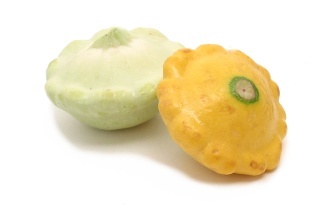 The difference between winter and summer squash is that summer squash has a tender edible rind and will not keep any length of time whereas winter squash has a tough rind and will keep several months in a cool place such as a cellar. 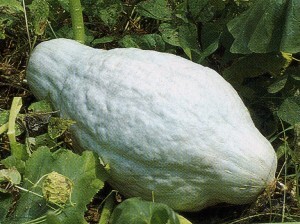 A Hubbard squash ready for harvesting. In 1899, the U.S. Dept. of Agriculture Bulletin pronounced the White Bush Scalloped the best summer squash and the Hubbard the best late squash. The book claimed the Summer Crookneck was a prolific bearer but in the markets it often sat on shelves while the scalloped varieties sold quickly. There was also a winter squash called the Pennsylvania Dutch Crookneck which should not be confused with the summer crookneck. 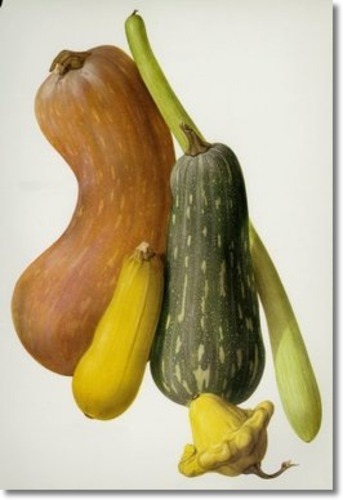 The Butternut evolved relatively late from squash similar to the winter Crookneck. Amelia Simmons’ receipt was published in the U.S. in 1796. She used a crookneck or winter squash. The squash was cored, boiled, and then skinned. The pulp was mashed, mixed with 6 large pared, cored, and stewed apples, 6 or 7 spoonfuls of dry bread or biscuit, “rendered fine as meal”, one pint of milk or cream, 2 spoonfuls of rose-water, 2 spoonfuls of wine (she did not specify red or white), 5 or 6 beaten eggs, a pinch of salt, sugar to your taste, and one spoon of flour. The pudding was baked for one hour. When boiled with the skin on, rubbing a winter squash through a sieve will separate the pulp from the skin which will remain too tough to push through the holes of the sieve. In 1911, Rufus Estes’ version was made from a pint of mashed, cooked squash, a cup of sugar, 1 tsp. ground cinnamon, pinch of salt, the juice and grated rind [zest] of a lemon which was stirred together with a quart of boiling milk. When the mixture was cool enough not to coddle the eggs, five eggs were stirred into the mixture. The pudding was poured into a baking pan which was set into another pan of water and placed in a moderately hot oven. The pudding was baked until firm in the center. He suggested serving it with cream. Modern recipes tend to use liberal amounts of vanilla rather than lemon and sometimes they also list ground nutmeg as an ingredient. Evaporated milk can be used if desired in place of fresh milk or cream. Scalloped squash come in a variety of colors and are an old variety. These recipes are equally good with pumpkin or cushaw. Since cushaws tend to be large portions of the cooked and mashed pulp can be frozen for making puddings later. In a pinch, canned pumpkin can be used. A variety of squash, winter crookneck in back, scalloped yellow in lower right.